Losing 10 lbs. in four weeks takes discipline and a strict diet. The foods you eat reflect the number that is revealed when you step on the scale. It takes more than a workout to keep a steady weight loss. Choosing to restrict your calories and fill up on nutrient-dense foods will help you reach your desired weight loss goal. A healthy weight loss is 1 to 2 lbs. per week. Aiming to reach a 10 lb. weight loss in four weeks means you will need to lose on average of 2.5 lbs. per week. Losing weight is all about burning more calories than you consume each day. To lose 1 lb., you will need to burn 3,500 calories. Burning 1,250 calories a day should result in the weight loss you need to reach your goal. Weight loss results from creating a caloric deficit. Choose to monitor your calorie intake each day to keep you on track for a weekly weight loss. The American Heart Association recommends that women do not fall below 1,200 calories per day and that men do not fall below 1,500 calories. A calorie deficit can come from both restricting your calories and working out. Perhaps maybe you burn 500 calories working out and cut back 1,000 calories from your food intake. Making smart food choices will save you hundreds of calories to promote a faster weight loss. Choose to consume low-fat dairy products instead of regular dairy products. Low-fat products contain all the same nutrients, but do not contain saturated fat. Choose lean meat cuts or beans for your protein sources instead of red meats, which are high in saturated fats. Be mindful to consume a balanced diet. The McKinley Health Center recommends a diet that contains 45 to 65 percent healthy carbohydrates, 20 to 35 percent healthy fats such as monounsaturated fats, and 10 to 35 percent lean proteins. 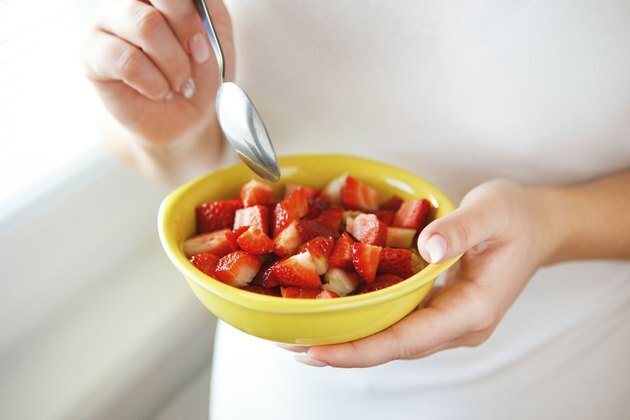 Fiber-filled foods will help you lose weight because they promote a feeling of fullness. Feeling full and satisfied will prevent you from overeating unhealthy foods later in the day. Whole grains, fruits, vegetables and beans are all healthy sources of fiber. Recommended fiber intake is 25 to 30 grams per day. Add fiber to each of your daily meals and snacks to keep you satisfied.